As we revamp and streamline good ole Tenacious Toys, we have taken a good hard look at our shipping options and figured out some ways to benefit our customers. 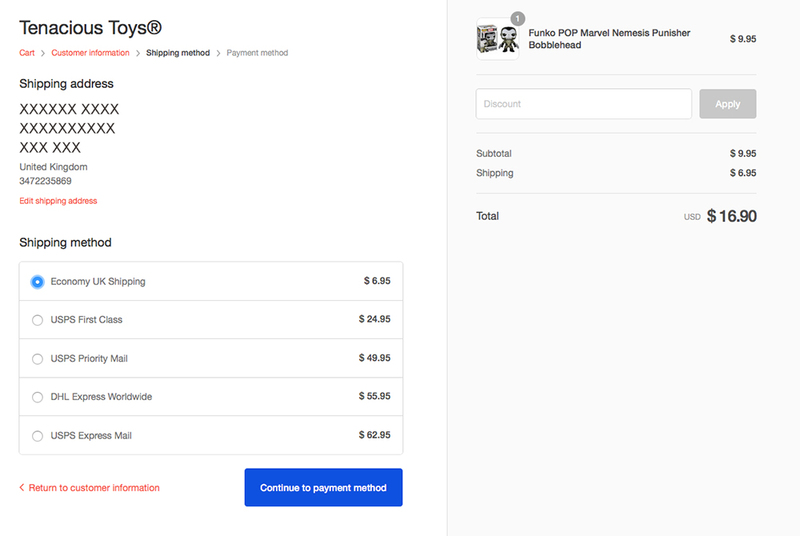 So, in addition to the recent announcements we've made about our domestic shipments (more ship options, lower Free Shipping number), we've been able to make some extremely favorable updates to the ship options that we offer to our friends and fans in the United Kingdom. Say you love Kidrobot's 3" Dunnys. Screenshots from the Tenacious Toys shopping cart- these new rates are LIVE right now! 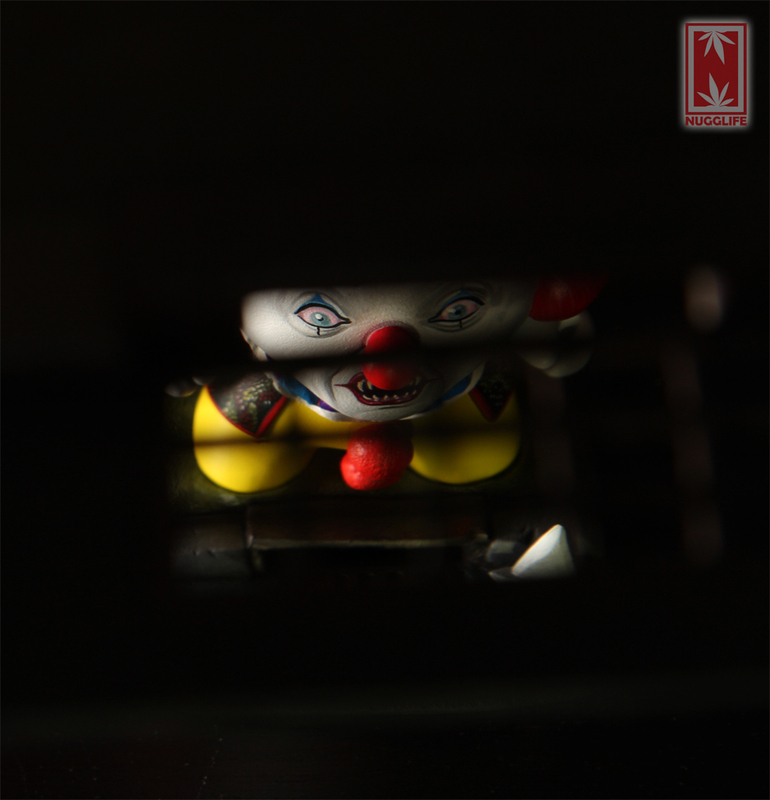 We hope this encourages our fans in the UK to start considering Tenacious Toys as an honorary UK toy shop... We know that good toy shops are hard to come by these days, both in Europe and in the US, and we want ALL art toy collectors to continue to have easy access to all the newest items. Feedback welcome, and PLEASE spread this info around! Any questions, please comment or email us. Opposites are everywhere. Light and dark, Black and white, Tall and Short, Sane and Republican party. 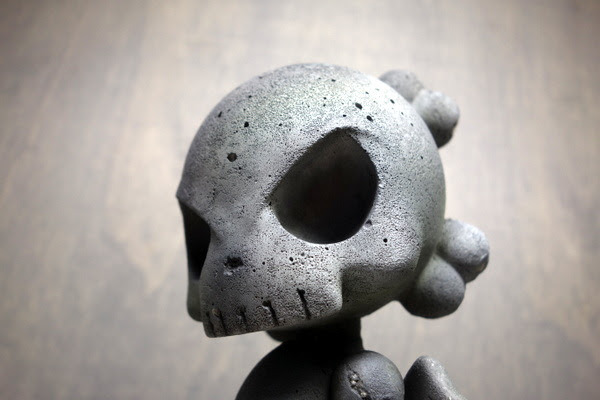 Huck Gee released a beautiful crystal clear Skullhead Blank, which of course led to a pitted opposite creation, The Cement Skullhead Blank. 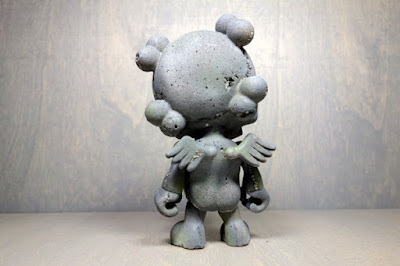 Created using (most likely) actual cement(indeterminate ratio), The Cement Skullhead features pits and holes and for all intents and purposes, is the polar opposite of the clear Skullhead. Priced at $150 each, plus shipping, these filthy creations will go on sale April 4th, at 12pm PST. Limited to just 75 pieces, the lead time is around 6-8 weeks for shipping. 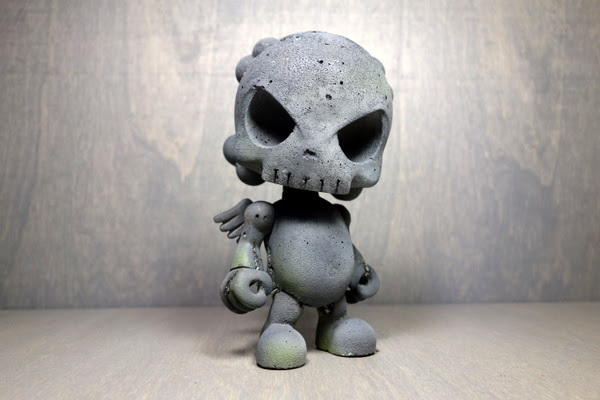 Who knows, maybe a nicely colored cement custom creation will come calling quickly after collectors clean cut brown boxes open, revealing the splendor that is the Cement Skullhead Blank. With ToyConUK 2016 right around the corner, artists are making final preparations for the trip across the pond. 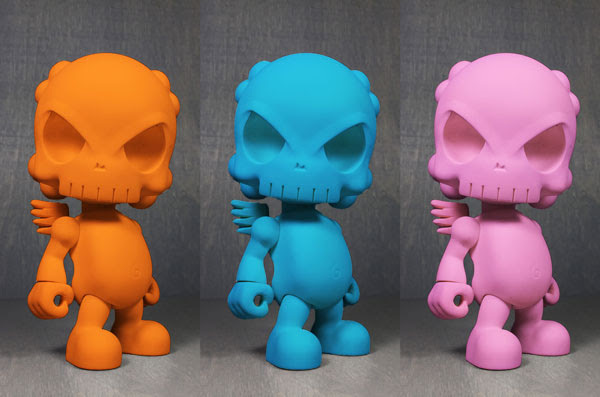 Huck Gee is making the trip back to his motherland and he is bringing along some colorful Skullhead Blanks as ToyConUK exclusives. 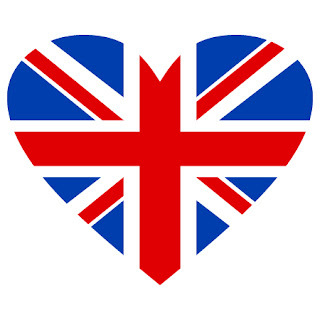 Orange, Blue and Pink are the color choices for ToyConUK, with Orange and Pink being made available at the actual convention. The Blue Skullhead Blank will only be available at the Toy Chronicle hosted ToyConUK 2016 After party, thus the blue hue. 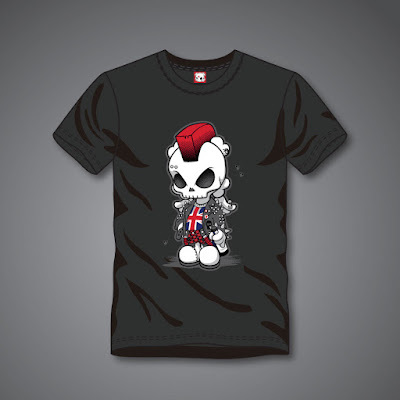 In addition to the colorful resin to add to dusty shelves, Huck will also be bringing a batch of new Skullhead Punk T-Shirts. Hand Colored prints, watches, banners, stickers and a few customs will also be available at ToyConUK. 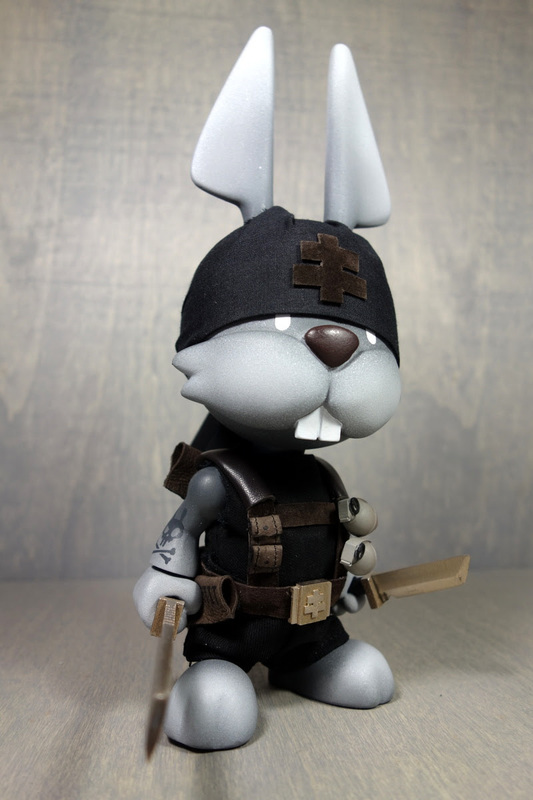 For those attending the convention, be sure to arrive early as many of the items Huck will be bringing will most likely sell out. 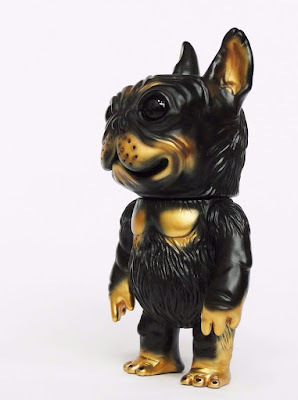 Credenda Studios recently released their first line of O.G.R.E mini figures. O.G.R.E stands for Obnoxious Ghouls Ruining Everything and this first release features Leroy, Gunther and Hugo. 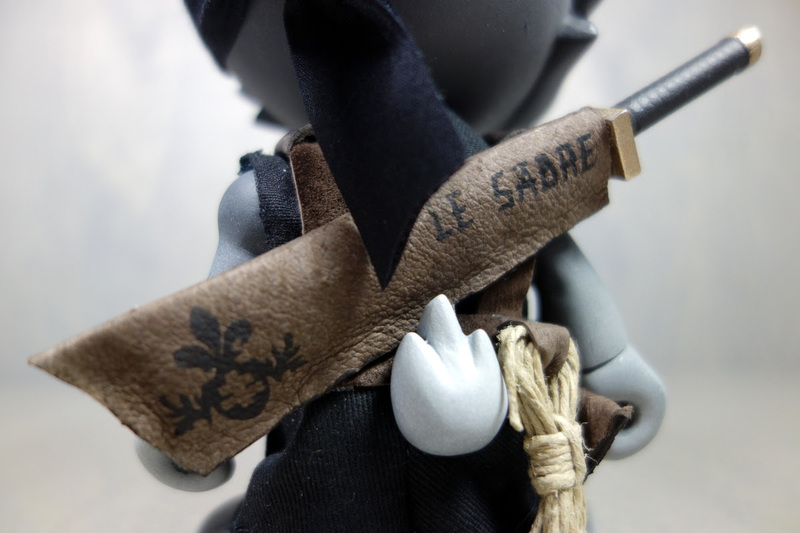 Measuring in at 2", each figure comes bagged with a header card and is sold blind bagged style. The initial run features figures cast in a transparent purple, with glitter sparkle added in. Priced at $10 plus shipping for each figure, purchasing 3 figures will guarantee receiving one of each figure in this first release. Check out Credenda Studios' online store for more info and to make a purchase. 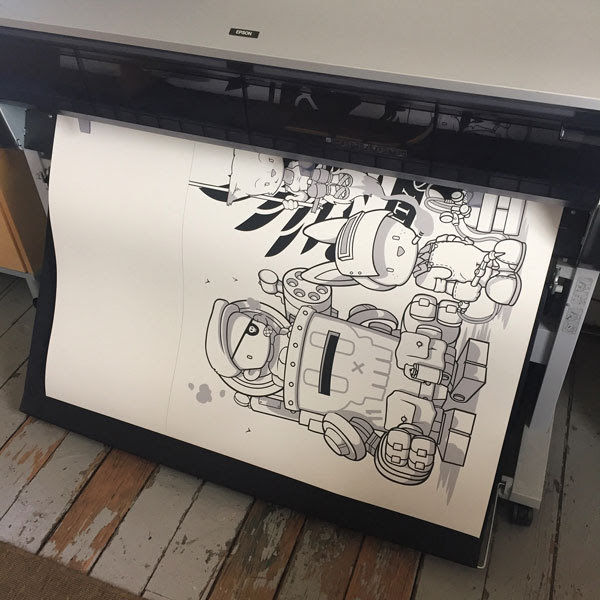 As a working artist, I'm constantly dividing my time between the development of my studio art and the production of various products inspired by that artwork. I'm always searching for ways to re-interpret my studio work and take advantage of collector trends, whether it be limited edition prints, or "art toys". In case you didn't know, Inner State Gallery is a part of the Detroit based print producer and distributor 1xRUN. 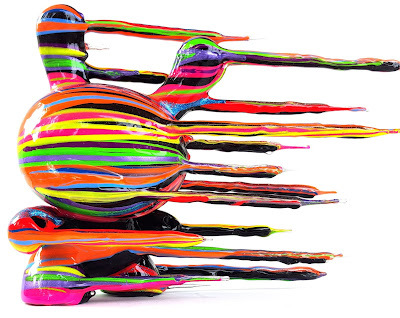 For many years, I've had the pleasure of working with 1xRUN, and I've seen them grown and diversify. For my upcoming "Damaged Goods" show, I want to create a show that I could only do with Inner State / 1xRUN. For that, I plan on taking advantage of the tools and technology that they have on site. 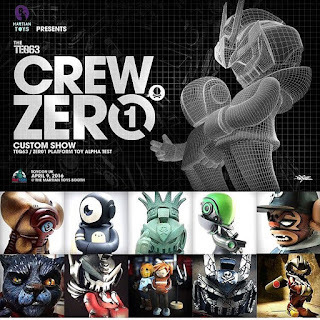 From silk screen reproduction, to hand embellished prints, to laser cut editions, this show will truly push the boundary of the kind of art work I've created and explore the merging of art and commerce. 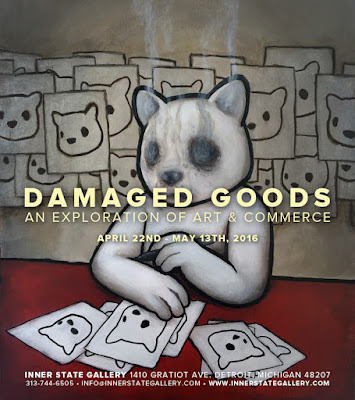 Opening on April 22nd, 2016 and running through May 13th, anyone in the Detroit area should make the way out to Inner State Gallery and join them for the opening reception on April 22nd. For those who won't be in attendance but still interested in purchasing any art, be sure to get on Inner State Gallery's preview list. This is the Infinite Rabbits' custom TEQ63/Zero1 (by Quiccs) for the Crew Zero1 that will be available at the Martian Toys booth at Toy Con UK, April 9, 2016. 3AGO WW7174 SET ONE GHOST HUNTER BERTIE VS SHADEY EDO TK, part of the 3AGO Collectible Series designed by Ashley Wood is available from BAMBALAND 3A for USD $126 with included worldwide shipping. Crossover figures from the many worlds built by creators Ashley Wood and TP Louise in 3AGO Scale! 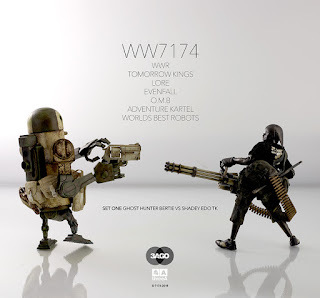 Each set includes a 10page WW7174 Comic by Ashley Wood and TP Louise! Phil Noto is an Eisner nominated American painter, comic book/ concept artist who is known for his work on such titles as Black Widow, Jonah Hex, Uncanny X-Force, and most recentlyStar Wars (Chewbacca and Shattered Empire). After a 10 year career at Disney Feature Animation, he started to work full-time as an artist for Marvel, DC, Image Comics and Dark Horse, and as well, time in gaming working on such blockbuster hits such as Bioshock. 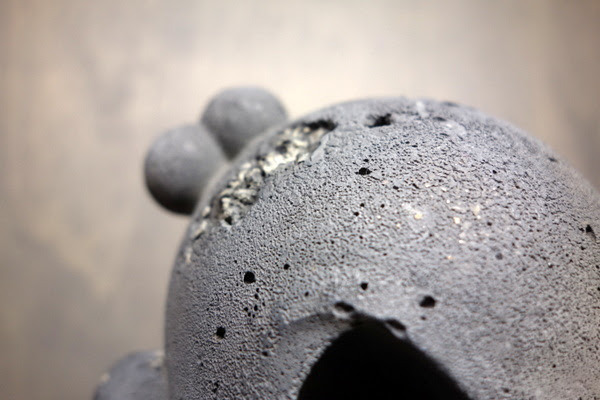 "Silent Frequency" is going to run from April 1st to May 1st, with the opening reception from 6pm - 9pm. Purchase inquiries will begin at 12pm pst, on Monday April 4th. 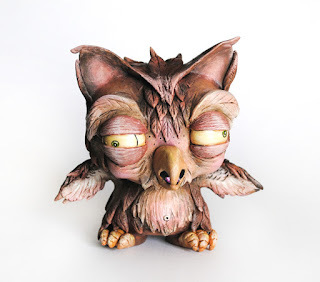 For those in the area, be sure to head on over to Stranger Factory Gallery for the opening reception. 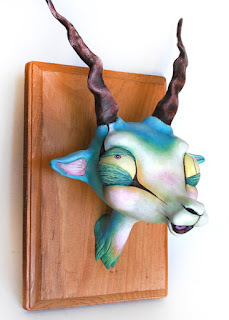 Everyone else will just have to view the pieces through the Stranger Factory website. Releasing on April Fool's day is Rokudenashi Sleepwalker by Flabslab and Paulus Hyu. 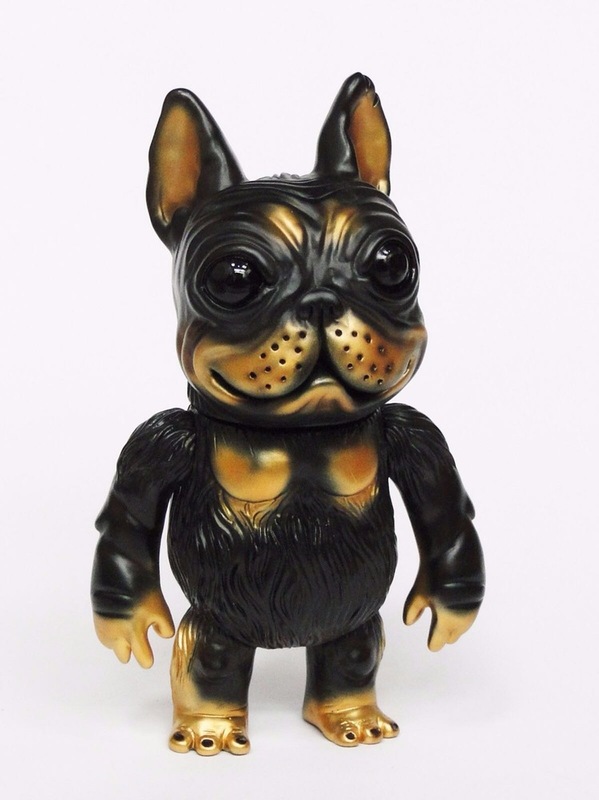 A ridiculous lovechild between a Rottweiler and a French Bulldog, he was unplanned, unwanted and totally neglected. Based on the Sleepwalker character created by Paulus Hyu, each of these pieces were painted by Paulus. 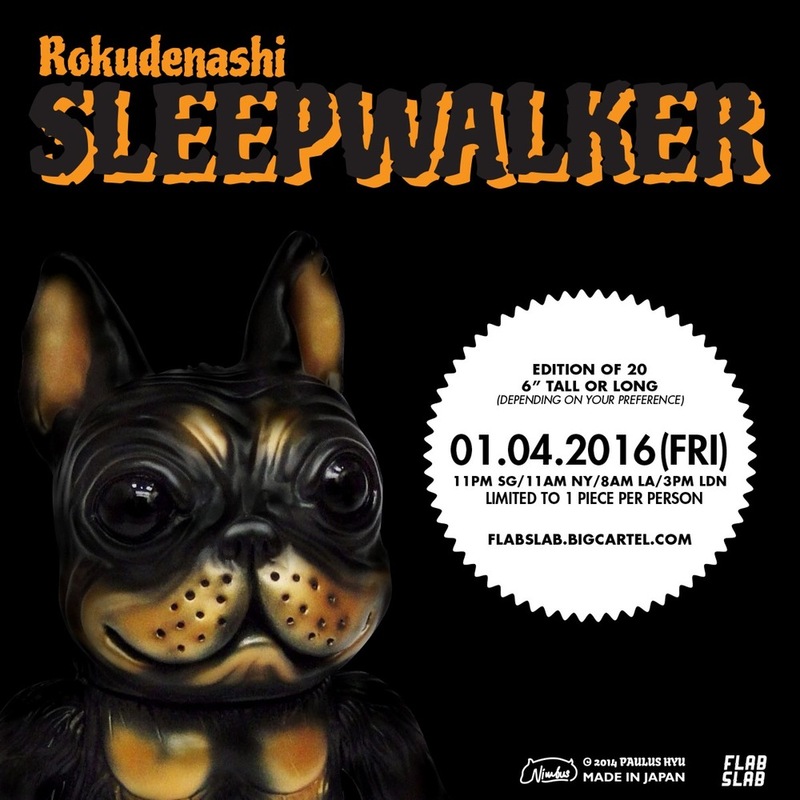 Limited to just 20 pieces, each Rokudenashi Sleepwalker measures in at 6" tall and is priced at $130 plus shipping. Interested buyers need to keep in mind the release time and note that these are limited to just 1 piece per person. Be sure to check out more of Paulus Hyu's work here. 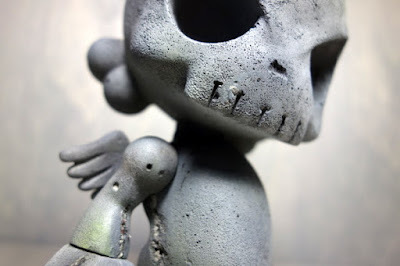 FLABSLAB, out of Singapore, is always hard at work creating new things. 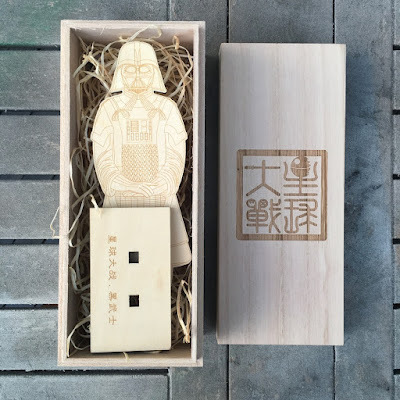 A couple of their latest creations involve laser cut wood and acrylic panels. 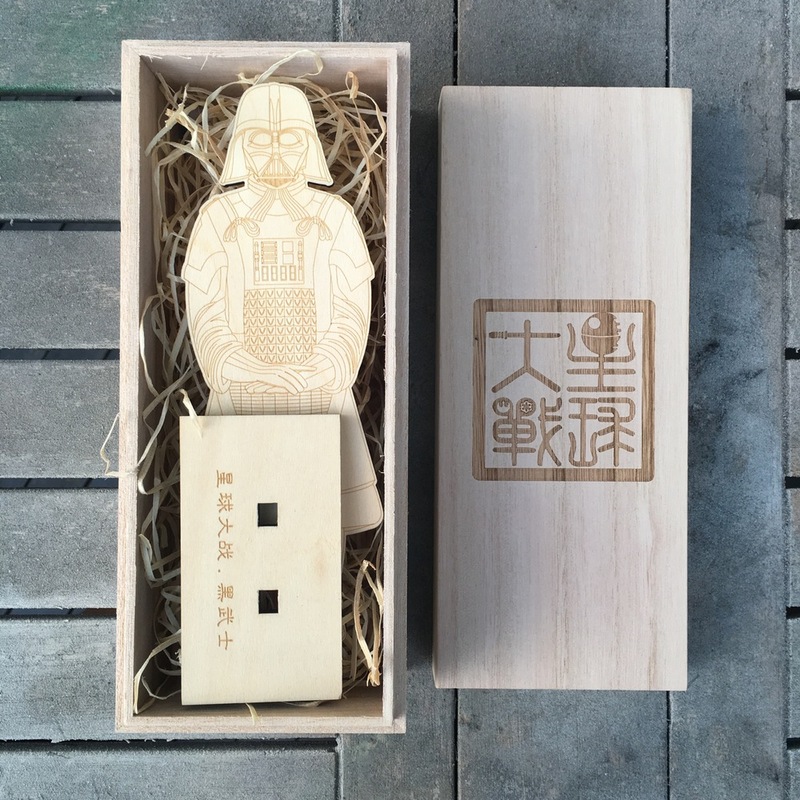 DarthTerra, a Terracotta soldier and Darth Vader mash-up, has been created in 2 versions. 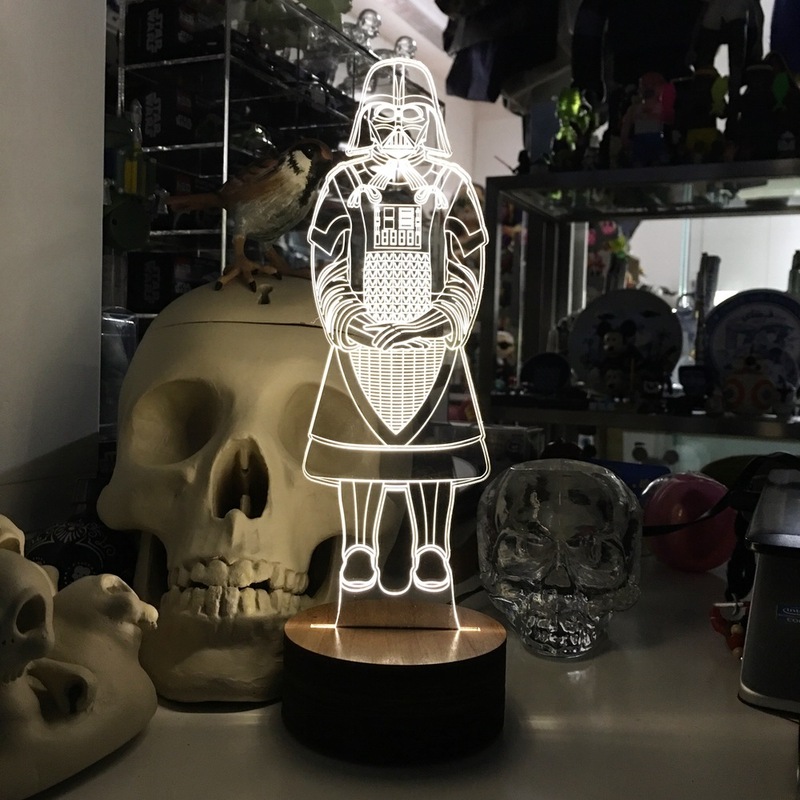 The acrylic DarthTerra features a wooden base with an LED integrated into it, which lights the DarthTerra acrylic piece nicely. The acrylic is 4mm thick, while the entire setup measures 24.7cm high and a 8cm diameter base. Priced at $45 plus shipping, there are only a limited number of these acrylic DarthTerras. In addition to the acrylic cut version, FLABSLAB also released a laser woodcut DarthTerra. 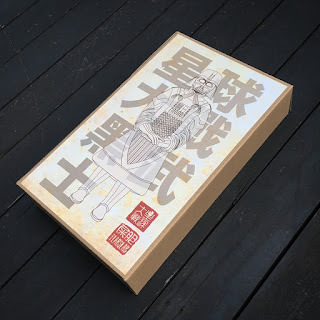 The design is the same as the acrylic DarthTerra but is completely made out of wood, packaged in a nice wooden box. 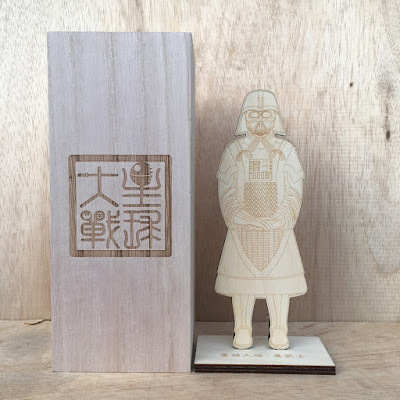 Laser cut wood DarthTerra is priced at $44 plus shipping and is also produced in a limited number. Pick up one of these wonderful pieces before they are gone forever. Kasey Tararuj is a NJ-based artist who experienced a traumatizing moment in her teenage years when an unexpected AVM on her spinal cord took away the use of her legs. 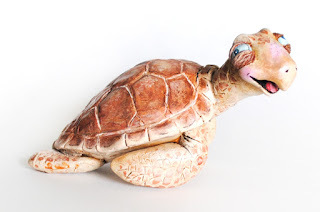 Through this experience, she found her passion for art both life changing and life saving. Fifteen years of creating art on a highly therapeutic level has led Kasey to her current body of work featuring lighter subjects. Work intended for giggles, for others to relate to, and simply for the sake of creating something fun. "Playtime" features a collection of 3D works focusing on beauty and light-hearted nonsense. 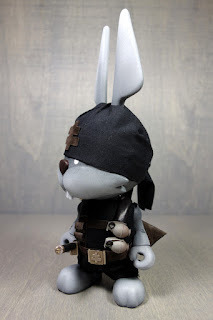 Custom vinyl toys and original sculpts of spirited characters each use humor and emotion to convey a unique personality. 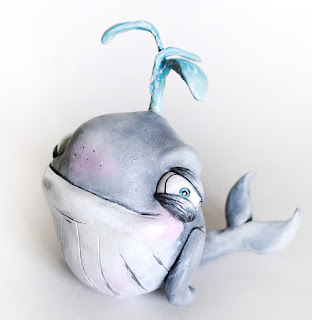 Little bits of the artist's own personality as well as influences from daily life are depicted in these whimsical little characters. Whether it's amusement, playfulness, hunger, boredom, or defeat, they are all full of life and love. The exhibit will be on display Friday, April 1 - May 28, 2016 at Speakeasy Art Gallery 816 Main Street, Boonton, NJ 07005. Following the amazing success of Josh Mayhem's Blown Away Dunnys which Sold Out through Kidrobot.com, Josh has decided to open up some commission spots for these amazing pieces. For those who missed the initial release through Kidrobot, Josh has opened up a very limited number of spots for collectors to purchase. 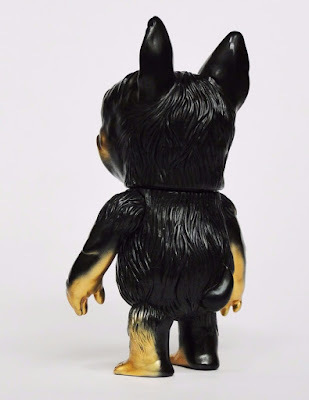 Pricing for these commissioned pieces remain the same as those sold through Kidrobot, with the 3" piece selling for $100 and the 8" piece selling for $500 each. With only 20 spots available for the 3" Dunnys and 6 spots for the 8", this is a great opportunity to snag one of these amazing pieces. With these pieces being sold as a commission, expected delivery is August 2016. 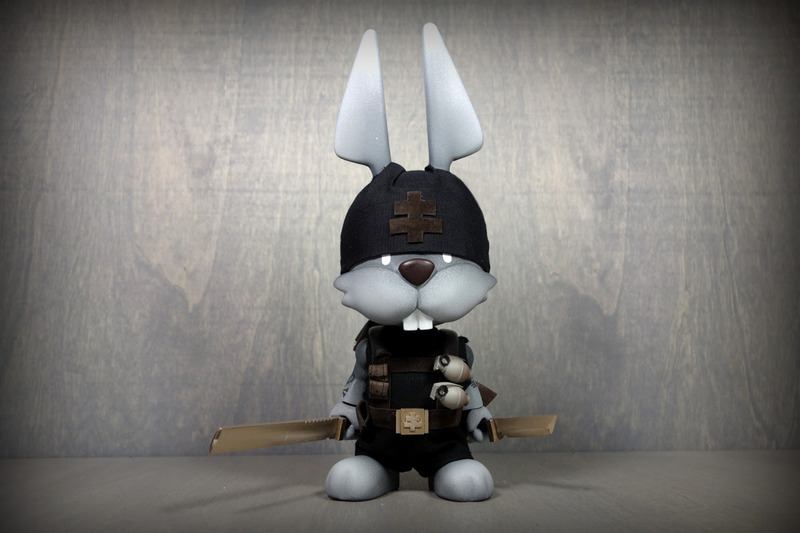 This may very well be the last chance to own one of these Blown Away Dunnys at a reasonable price, who knows what will happen in the future. Snag a spot today through Josh Mayhem's online store. After a bit of a hiatus and some time away from the couch, the Toy Break crew came back to the tube on March 23rd with Episode 381. In addition to starting back up reviewing toys and such, with guests on the couch, it was also announced that 24 hour Toy Break will be airing on April 1st through April 2nd. 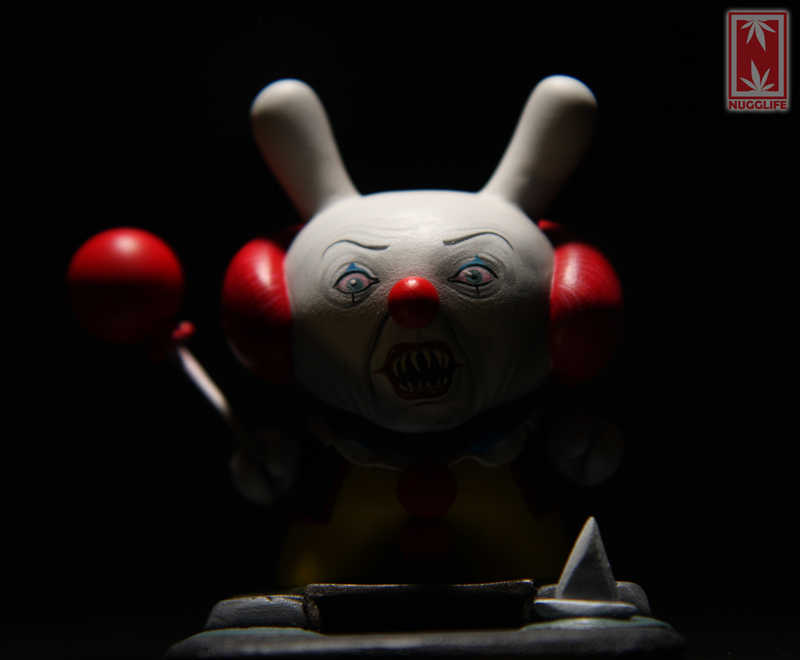 Starting at 5PM PST on April 1st, the Toy Break crew will start the 24 hour marathon to raise funds and asks everyone to join in on the fun, for any amount of time that allows. Of course, there will be some who are going to stick it out for the entire 24 hours, but most should at least check in throughout the 24 hour marathon. One of the great things about 24 hour Toy Break are the auctions that happen, real time, during the event. 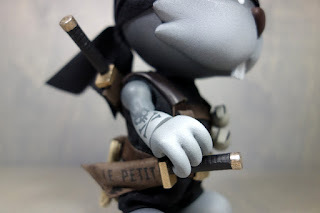 Everything from production vinyl, to hand made plush, and even some on the spot doodles and sketches have been seen in the past. All of which are typically auctioned off in the UStream Comments section. Featuring guests, reviews, antics and more, there is no telling what is going to happen as the clock ticks down starting at 5pm. In the meantime, check out Episode 381. 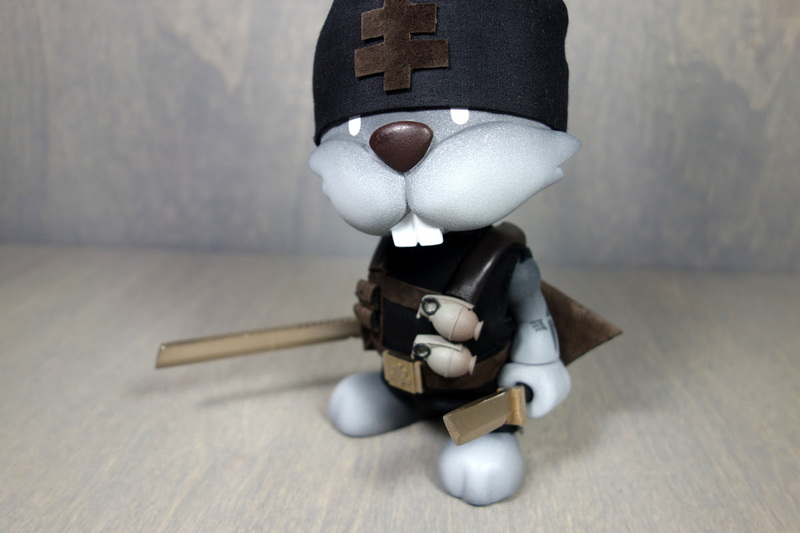 DrilOne has quite a few number of custom pieces available. 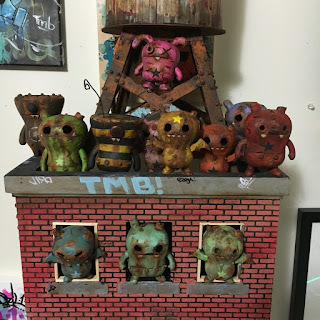 Everything from a custom Ugly Doll blindbox series, to customized Boundless Brooklyn Water Towers. 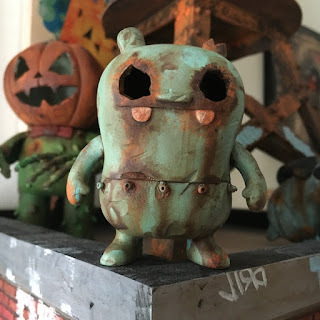 Each Ugly Doll blindbox is priced at $75 plus shipping. 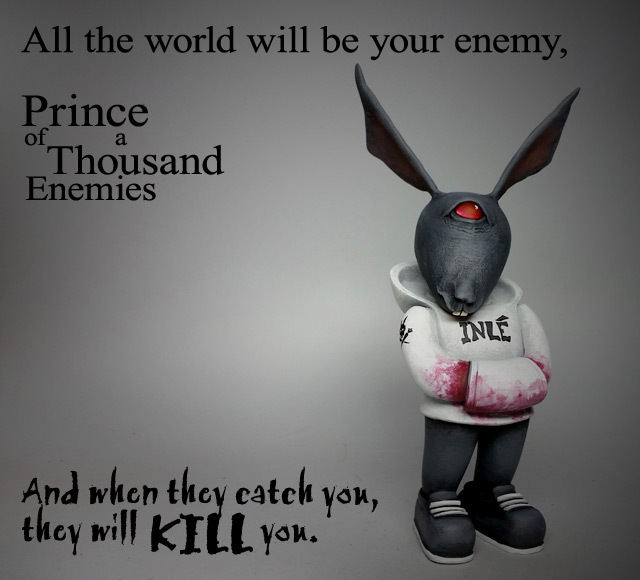 Be sure to check out all of the other goodies in DrilOne's store. 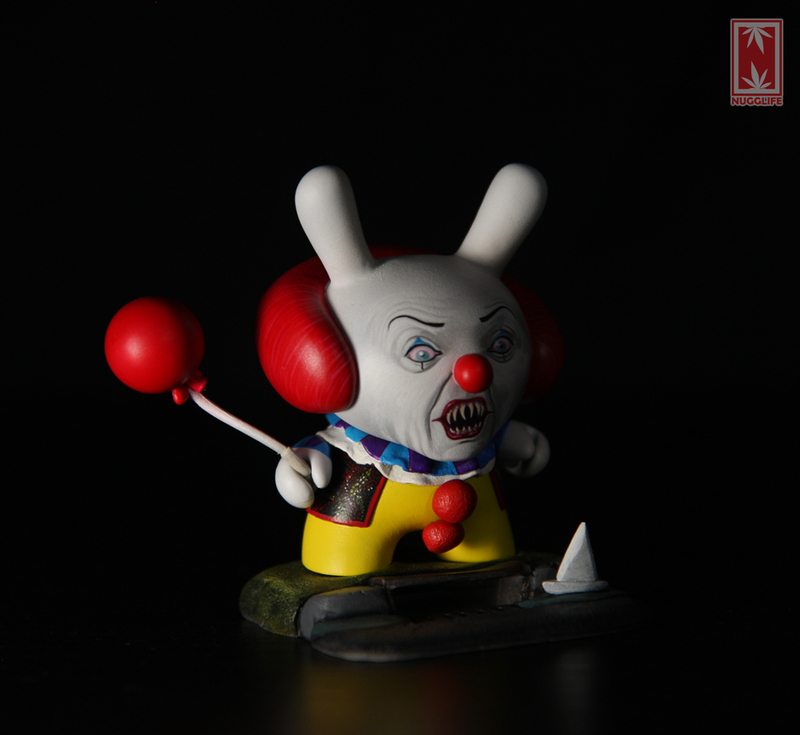 One of Nugglife's latest commissioned pieces is a custom clown Dunny, Pennywise. Complete with creepy facial features and bright red nose, Pennywise is a cult classic character. This piece is sure to make the new owner quite pleased. Those interested in getting a commission from Nugglife should get in contact with him asap, Con season is coming and time becomes very limited for everyone. 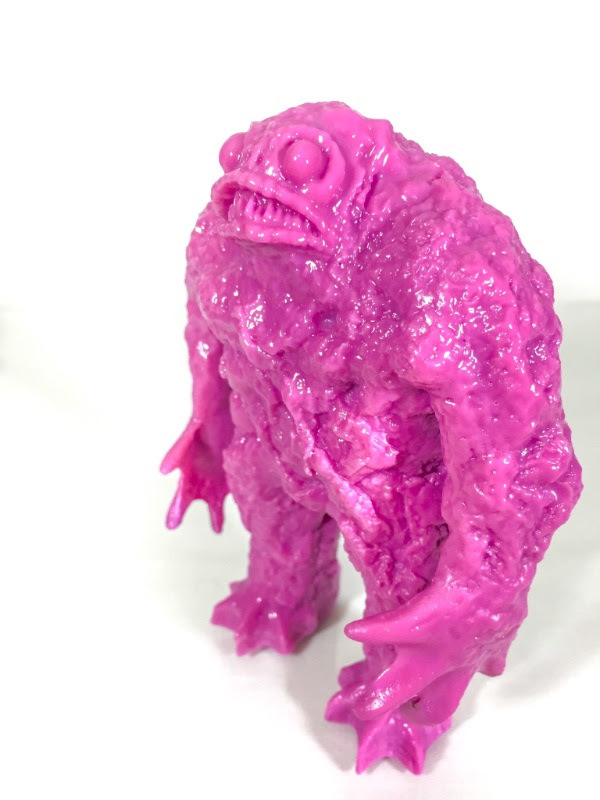 Gorgoloid's latest release are blank versions of the Kaiju Rhaal 5" figure. 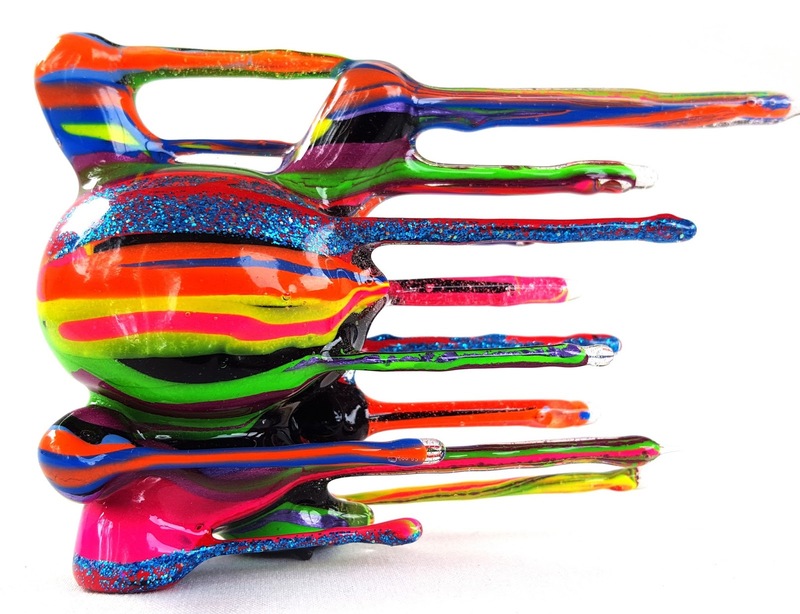 After settling into a new location and studio, Gorgoloid created a limited number of these 5" Kaiju Rhaal fgures, in a rainbow of different colors. Priced at $70 plus shipping, there are a good number of different colors to choose from. 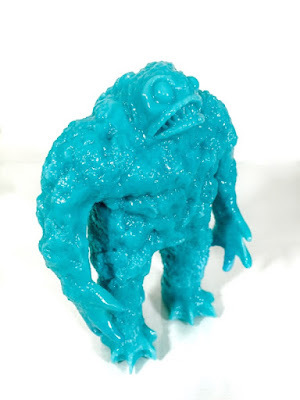 Available now from Gorgoloid's online store, the Slime Green colorway is already sold out. 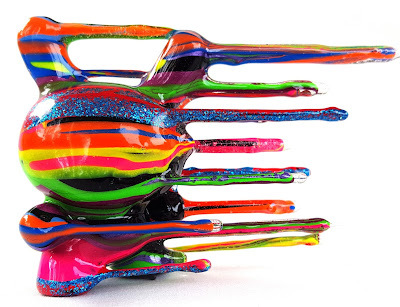 Each figure is solid resin, using Monster Kolor dye to create each color. 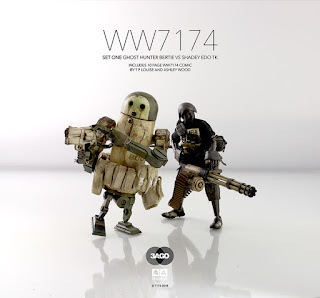 Pick up one of these nice figures and get painting.